Urban sprawl is quite literally sickening according to researchers at Toronto’s St. Michael’s Hospital, who found obesity and diabetes rates are higher in suburban areas that discourage walking. Most suburban communities around the world encourage car use and discourage walking. In addition to being bad for the environment, the unhealthiness of spread-out, car-dependent neighbourhoods was clearly spelled out in a new study by the St. Michael’s Hospital researchers. While Canada is facing an obesity epidemic, scientists from the hospital’s Centre for Research on Inner City Health found that the risk of obesity and diabetes was elevated by as much as 33 per cent in Toronto’s suburban areas. New development on Melbourne’s urban fringe. 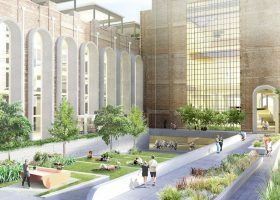 The rapid growth of built environment and health research over recent years has shown that a neighbourhood’s design has a big impact on the health of its citizens. However, relatively few studies have considered the potential effects of density and destinations on walking behaviours and related health outcomes. The objective of the study was to examine the individual and combined associations of residential density and the presence of walkable destinations, two of the most commonly used and potentially modifiable components of walkability measures, with transportation, overweight, obesity, and diabetes. “We examined associations between a previously published walkability measure and transportation behaviours and health outcomes in Toronto, Canada, a city of 2.6 million people in 2011,” they said. The report found that downtown areas are more pedestrian-friendly as they are divided into shorter city blocks and have a higher population density. In addition, the these neighbourhoods have more stores, services and other amenities within walking distance. In contrast, a number of suburban neighbourhoods in Toronto do not even have sidewalks. Vehicles crowd a Los Angeles freeway during rush hour. People living in walkable communities stroll more often and cycle and use public transit more frequently instead of driving, which offers health benefits. The report said individuals living in the least walkable areas had a 49.7 per cent prevalence of being overweight or obese compared with 41.3 per cent in the most walkable areas. 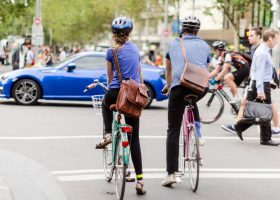 According to the report, people living in suburban areas owned almost twice as many vehicles and were almost twice as likely to travel by car when compared to people living in the city. They were also roughly half as likely to use public transportation and roughly one-third as likely to walk or bicycle. Discouraging driving and broadening opportunities for strolling, cycling, and using public transit do not constitute a “war against the car,” as Toronto Mayor Rob Ford has said, but part of a battle for a healthier lifestyle. The report recognized that other factors beyond walkable neighbourhoods, do affect risk of obesity, such as affluence and ethic origin. However, by contributing to physical inactivity and therefore to overweight and associated health problems, sprawl has negative health consequences. Individuals living in the least walkable areas showed a 49.7 per cent prevalence of being overweight or obese compared with 41.3 per cent in the most walkable areas. The researchers encouraged urban planners and activists to cut sprawl and create walkable communities. “Policy-makers can play an active role by promoting neighbourhoods specifically designed as healthier places to live,” they said. The report also highlighted the need to create fewer single family homes and more multi-residential buildings, and to develop more easy-to-walk-to mixed use areas, expanded public transit lines and bicycle lanes. Commuting by car has been of interest to psychologists as a source of stress, stress-related health problems, and even physical diseases such as back pain and cardiovascular disease. As people spend more time driving on more crowded roads, an increase in these health outcomes might be expected. Aerial view of Sydney’s urban fringe. Further research is needed to clarify the complex relationship between population growth, land use, transport and health, and to find the correct approaches to urban planning in order to reduce air pollution and urban heat, to encourage physical activity, to reduce automobile dependency, and to promote mental and physical health. Although this report has focused on the health costs of sprawl, other forms of built environment, such as dense cities, remote rural areas, and small towns all have advantages and disadvantages that need to be assessed. As urban planners, governments and communities recognize and understand the health costs of urban sprawl, they can start to design solutions. Interesting article, it really highlights all the considerations. I think cities with successful urban landscapes that are pedestrian and cycle friendly such as Amsterdam and Copenhagen should stand as a benchmark to cities globally. There is no reason this method couldn't be customised and rolled out in suburban areas on a smaller scale.